Canada Pharmacy Online > Blog > Eat Healthy When You’re Traveling? Sure, there’s an app for that! Eat Healthy When You’re Traveling? Sure, there’s an app for that! It’s one thing to stick to your chosen diet plan when you’re at home. When you cook for yourself, you can control the food you buy, choose cookbooks that encourage you to stick to your conception of healthy food, and buy kitchen gadgets to help you eat better. But when you’re on the road? Good luck with that. Even if you can resist the lure of forbidden-to-you foods (“Oh go on, treat yourself!") often you simply don’t know what’s on the menu. Inevitably, a vegan will find himself gnawing on an uninspired plate of fried zucchini (surrounded by apologetic friends – the vegan surrounded, I mean, not the zucchini). Or someone committed to a low-sugar diet will have to “make do" with a sorry excuse for a salad, while her friends cheerfully eat their junk food. If you’re serious about staying healthy, then, these mobile applications – and one gizmo – might help you stay on the straight-and-narrow path. In addition to coping with dietary challenges, they can help you discover health-aware restaurants, including those that source farm to table or focus on local and sustainable ingredients. The Tasteful Restaurant Finder (free, available for iOS and Android) is a bit like “Yelp for the diet-conscious." You select the diet to which you adhere, either in general terms (vegan, gluten-free, paleo) or with a specific ingredient (avoid tree nuts, no dairy). Tasteful tells you about the restaurants in the area that meet your criteria, even if the restaurant doesn’t blare such a label. For example, when I searched for paleo-friendly restaurants, Tasteful tells me about the vegetarian Thai place nearby. The app also shows a steakhouse that it says has 14 paleo options (noting “substitutions may be required," presumably for the inevitable baked potato), as well as the nearest outpost of the Chipotle Mexican food chain. The app does have a few quirks (it whined about the password I chose after it accepted it), and its database of restaurants is not yet extensive outside big cities. But it’s still quite helpful when you’re traveling. It’s one thing to look for a restaurant tuned to your needs. But sometimes you have to do the best you can with the options available. Rise’s Healthy Out (free, for iOS and Android, U.S. only) find healthy foods on restaurant menus, and recommends the best option for different diets and eating habits. So, for instance, you might find yourself at a Red Lobster when someone at work chooses the chain restaurant as the spot for a team gathering. Healthy Out suggests 9 options, including a wood-grilled tuna served with broccoli. If you can say No to the biscuits and ask for a garden salad instead, it’s 300 calories, 68% protein, 3 grams of fat, 200mg of sodium… and so on. Since you can look that up ahead of time, it’s also vastly reassuring. I find myself thinking, “Oh good. I won’t starve." Sugar Rush (free, for iOS and Android) promises to help you discover added sugars in your food. It’s essentially a barcode scanner that consults a nutrition database and reports on the results. That’s particularly valuable when you’re on-the-run and perhaps consuming more pre-packaged meals than usual. Because sometimes, despite your best intentions, you find yourself in a truck stop in the Oklahoma panhandle. You might think: So what? Why do I need an app? I can just read the nutrition information on the package! However, so many items include sugar in multiple forms, such as corn syrup and sucrose and sugar. For many of us, natural sugars are fine; it’s the added, refined sugar that is worrisome. As a result, this app is good for identifying the health value of the protein bar you stuffed in your purse, or deciding if the “energy drink" in that truck stop is a bad idea. Sugar Rush is the little brother app of Foodicate, which pulls up more detailed nutritional information about food products from their barcodes and displays a letter grade from A to D to guide you. A similar app, Diet Scan, instantly calculates a food score by scanning product UPC barcodes. It’s more extensive than checking sugar levels, but that might be overkill for your needs. 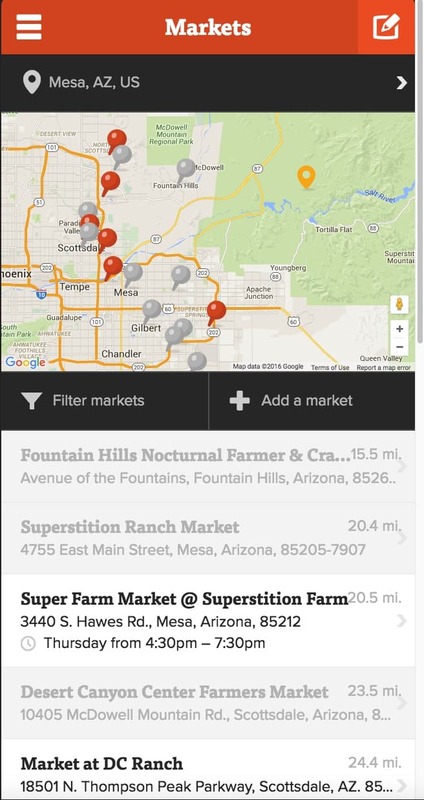 If you’re doing your best to “eat local" on the road, you’ll appreciate Farmstand (free for iOS, with an accompanying Web application) which helps you find nearby farmer’s markets. You can pick up fresh and in-season produce, which will benefit your pocketbook as well as your waistline. The idea behind Farmstand is good, but don’t depend on it completely. In my local area, it correctly identified the farmer’s market at Roadrunner Park, including its hours (Saturday 8am-1pm), but the app failed to note that the market is closed part of the year. I’m using this app as a starting point rather than an authority; as more people post updates and reviews, it’ll become more valuable. This is a (mobile-friendly) website rather than a standalone app, but HappyCow is so nice that I’m extending my rules. 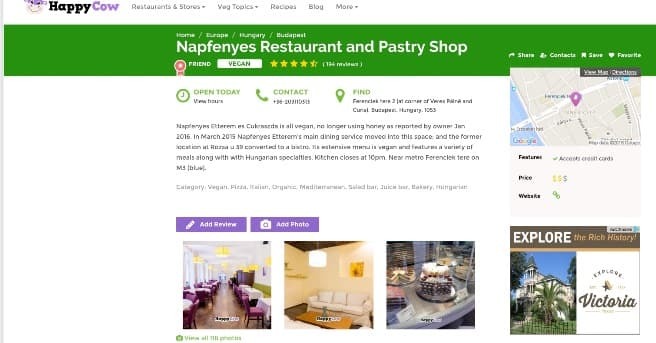 This mapping tool for vegetarian and vegan restaurants is Yelp-like, including reviews, location, and restaurant features (such as price and credit card acceptance). It’s popular enough that the number of real reviews is extensive and thus the crowdsourced opinions are truly useful. Specific to those who are gluten intolerant: If you’re willing to carry around something beyond a smartphone, and you have the patience to wait for a product that isn’t shipping yet, consider the Nima Sensor. The $249 device (3.5" x 1" x 3.1" high) uses chemistry and sensors to test the food on your plate. It detects gluten in quantities of at least 20 parts per million (the maximum level permitted by the U.S. Food and Drug Administration for products labeled as “gluten-free"). You put a a sample of food into the disposable capsule, screw on the cap, and insert the capsule into the device. Two minutes later, you see the results: a smile or frown. It’s impossible to judge something that isn’t shipping yet, but if you’re severely gluten-intolerent, the Nima Sensor may be worth the investment. The company also is working on similar devices for peanut and dairy detection. With these tools and apps at hand, it’ll be a lot easy to stick to your diet. Happy eating!